What? In our age of GPS and proliferation of data, we can’t count a number of buildings on a small island? It turns out we can’t, because buildings are so ephemeral! It’s as if they’re made of dreams, not brick, wood, steel and concrete. Dozens of buildings are demolished in Manhattan every year, soon forgotten, gone without a trace. They don’t even have to be old to be demolished – for example, 101 Murray Street, designed by Haines Lundberg Waehler, existed only between 1983 and 2006. It was an interesting-looking 10-story building, and I can’t help thinking that its design may have partially inspired IAC building and Via 57th Street. But it had been ruthlessly demolished, to give place to much more beautiful and taller 111 Murray Street. Real estate is unsentimental. The longer – but very imprecise and instantly outdated answer can be based on Fiscal Year 2018 Final Assessment Roll, compiled by the city. According to that document, in 2017 there were 147,754 parcels of developable land in Manhattan, to the full market value of $450,675,117,779, of which 4,577 were vacant lots. Each condominium unit counts as a separate lot. There were 94,570 condominiums in Manhattan in 2017. If we take 60 condominiums per building as approximate average (a figure I’m taking off the top of my head, based on experience), we’ll get approximately 1,576 total condo buildings in Manhattan. This leaves us with 53,184 non-condominium buildings. If we add together this number and the number of condominium buildings and deduct the number of vacant lots (53,184 + 1,576) – 4577 we’ll get 50,183 total buildings in Manhattan. And that’s as close to the precise number as we can get. But how many of these are brownstones? And what about townhouses? It’s easier with townhouses. We can count 2,084 single-family houses, 1,823 two-family houses, and 1,471 three-family houses, and that will give us the incomplete total of 5,378. My guess would be, there’s probably at least 2/3 of them are brownstones, but there’s no way for me to know for sure. And I’d bet there are a few thousands more old buildings that do not fit the categorization by the number of families living in them, but may still qualify as brownstones or townhouses. What are brownstones? And, come to think of it, what are townhouses? Historically, a townhouse is an urban dwelling for a noble family that usually lives in one or more mansions in the country, and comes to stay in their comparatively modest, but still luxurious dwelling in the city for a brief period of time, or for an opera season. Such houses would require several floors, with one or more floors allocated for servant quarters. For our purposes, today’s townhouse can be defined simply as a multistory urban house. A townhouse in New York typically occupies a fairly small parcel of land. They usually are 3-6 stories high (with no elevator), built from brick, and with stone-clad facade. Across the entire United States, the stones used for decoration of townhouses is often of noble light-gray color. The highest quality gray stone, known under names of Bedford Limestone, Indiana Limestone or Salem Limestone, had been quarried in south-central Indiana, between towns of Bloomington and Bedford. In New York City though, much more often than everywhere else in the country, rather than using limestone, the architects and builders historically preferred to use Triassic-Jurassic sandstone to decorate townhouses. That type of sandstone can be recognized by its beautiful reddish-brown hue, and most of it had been ferried to New York from the quarries near New Brunswick and Passaic, New Jersey. So, a brownstone is simply a townhouse decorated with that type of sandstone. Brownstones are not unique to Manhattan, but there are so many of them here that they came to be part of local style and mythology, not unlike yellow cabs or Manhattan clam chowder. That’s why brownstones are very popular among Manhattan real estate investors – I’d say, probably more popular than other kinds of townhouses in the city. Okay, I’m slightly exaggerating. In reality, color patterns for townhouses are chosen by individual owners, and the colors tend to be uniformly applied to the entire building. But we can discover some intriguing color choices sometimes. Manhattan, as we know, is chock-full of historic neighborhoods, and townhouses and brownstones are often in such neighborhoods… which sort of makes sense, when you stop to think about it, because townhouses and brownstones in this classic Manhattan style are no longer being built. You can easily recognize a landmark neighborhood by its street signs: they are not green, but reddish-brown (the color of brownstones). But, of course, you don’t really have to look for street signs to recognize a historic neighborhood: just look down the block, and you’ll see rows of beautiful buildings with stoops (stairs on the outside of the façade, often decorated with intricate ironwork), and often with stucco molding and even with gargoyles. Many townhouses feature bay windows – rounded windows protruding from the building built in such a way that looking through that window you can view the street from many angles. I saw bay windows constructed with such mastery and precision that they offer the view that can make your head spin, because they feel trigonometrically impossible – almost as if a window includes an extra special dimension. Imagine having such window in your townhouse, overlooking Central Park or Riverside Park! There are many townhouses on Upper West Side and Upper East Side, and also in Greenwich Village – neighborhoods and streets with long, interesting histories. Many of townhouses here are 70 to 100 years old or even older. Every now and then you can even come across a renovated 200-plus-year-old townhouse for sale in Manhattan, if you’re fortunate. Often almost every house in a street had been built around the same time, so the entire street for several blocks looks stylistically uniform. Townhouses are usually pretty narrow – anywhere between 15 and 30 feet in width, with the average width around 20 feet. Some of the original townhouses are used as mini-apartment buildings, and may include anywhere from 4 to 20 apartments. It’s a lucrative business to buy such apartment building and convert it into a luxury house for one family. There are many investors and developers who got rich doing this. If they could do it, why not you? There are several distinct styles among Manhattan townhouses (with a few overlaps here and there, and some lines blurred). Federal Style (popular in the early XIX century) is characterized by small scale and modest ornamentation. Such townhouses are the smallest (only 2 or 3 stories on a tiny parcel of land), and you can easily recognize them by attic windows cut through the slanted roof. Later, around 1830 to 1850, Greek Revival style became more popular (look for townhouses with Doric or Corinthian columns next to their entrances). In 1840s through 1860s, Gothic Revival style came into prominence (pointed arches, stone and cast iron ornamentations, with air of medievalism about them). Italianate style (1840s to 1870s and even newer) – many of such townhouses are on Upper East Side, and they are all without exception brownstones. You can recognize them by their combination of horizontal “bands” of stone decorating the façade, as well as ornamented cornices over the windows and around the roof. A very interesting style, also popular around that time, is known as Anglo-Italianate. You can very easily recognize these townhouses thanks to their very original and cool approach to decoration: their first one or two floors are decorated with brownstones and look almost exactly like Italianate buildings – but the remaining floors are not decorated at all, and all the way up to the roof they’re just bare bricks – or small stones that look like bricks! The Queen Anne style, from around 1870s till 1890s is like sudden burst of jazz after the classical music of all the previous styles. Highly eclectic, combining every feature of every style, with rough and smooth stones used for decoration, with stoops bent at 90-degree angle and with basement windows in them, with bay windows and architraves, friezes, and gables, with rounded elements in the plane, rectangular cross-sections and sometimes even triangular windows – these townhouses somehow manage to represent a stylistically unified whole, and are highly valued. In 1870 through 1890s, as a push back against this wildness, townhouse architects worked in the Romanesque Revival style, characterized by rounded arches and stern simplicity, slightly offset by asymmetrical structure of the façade. 1890s through 1930s were marked by the boom of townhouse construction and its gradual decline, with four styles coinciding in time: Renaissance Revival (taller buildings with balustrades, arches and balconies), Colonial Revival (very much like Federal, but even smaller and more minimalist, very symmetrical), Beaux-Art (highly elaborate, ornamented neoclassicism; a townhouse in that style looks more like a townpalace, and will cost you accordingly); and English Neoclassical (think “ancient Roman villa in the middle of New York, except with colder, rational Nordic demeanor in the place of Italian exuberance”). I consider myself among Manhattan’s top experts in selling and buying all types of townhouses, including brownstones. I bet you five bucks I’ve sold and bought more townhouses and brownstones in Manhattan than most people even walked by. Most of the townhouses I’ve worked on had been built around the time of the first phases of New York City subway construction. The entire island of Manhattan lies on top of humongous slabs of granite bedrock. When first subway tunnels were excavated, large pieces and blocks of granite were given to house builders practically free – this was much more efficient way to get rid of that granite than transporting it off the island somewhere. Builders used these chunks of super-hard rock for foundations of the brownstones. Whenever I see such granite foundation, I recognize the sturdiest and most valuable townhouse, and I know that I will sell it well and fast. A townhouse is priced even higher if it has unusually fine architectural or interior details, a great view of a park or a river or a particularly imposing stoop. And of course, as always, the closeness to public transportation contributes to the price. Some of Manhattan townhouses offer something extra-special. Older townhouses often had adjacent stables for horses and carriage houses built on the ground floor. Very few of such houses still exist, and like all rarities, they are highly coveted by buyers. Owners often convert such adjacent structures into grand “ballroom-style” garden lobbies – or into garages. Since there are very few townhouses with such garages, and they are expensive, we can be sure that a buyer would either own a very special car, or even a collection of such cars. A famous stand-up comedian, actor, writer, director and TV producer Jerry Seinfeld is an avid automobile enthusiast and collector. In 2002, he purchased a townhouse on Upper West Side with a carriage house, and converted it into a two-story super-garage with 4 separate car rooms, an elevator, a club room with a pool table, a kitchenette and bathroom, and a large office. The place hosts the rotating roster of Jerry’s collection of 46 Porsche automobiles. A high-tech HVAC unit on the roof maintains the ideal garage temperature, and whenever Jerry finds himself away from home and feels particularly nostalgic, he can open a special app on his mobile phone and view the real-time video feed of the entire interior of his garage and the street outside. There are approximately 300 townhouses with garages in Manhattan today. City has changed its laws, and today you can’t add a curb cut anymore, so adding a garage to a townhouse is no longer an option. Therefore, those townhouses that do include garages are highly sought-after, and cost considerably more. An interesting special type of property I believe every investor must be educated about is a mixed-use townhouse. We speak about mixed use when a townhouse includes an office or a retail component. In some cases, zoning allows – or even demands – the mixed use. Sometimes zoning also allows special signage. Walking down a beautiful Upper East Side street, you may notice that in one block filled entirely with townhouses there’s not a single business sign – and then in the very next block every other house has a sign for a lawyer or an accountant or a doctor, or a music school. That’s the effect of zoning: in the block where you see these signs zoning allows mixed use for townhouses, and any professional can place their silver, gold or copper identity plaque on the side of the house or even in the adjacent mini-garden. If you’re a New Yorker, when I ask you to visualize a townhouse, you most likely to imagine one located in a street. But there are townhouses on avenues, too. In almost all such townhouses there are stores in the ground floors, or sometimes even in the couple of lower floors, or in the basement. Avenue townhouses containing stores on three levels are not unknown, either. This can only be done when zoning allows such use. The reason why property owners may decide to take that approach is known as “highest and best use” – a very important term in real estate which means, basically, “whatever can bring you and others the highest value”. As an aside, so-called vertical shopping (stores on many floors of the same building) has not been very wide-spread in Manhattan. We know several vertical stores that existed for decades – Macy’s, Sachs 5th Avenue, Bergdorf Goodman – but these used to be rare exceptions from the predominance of street-level retail. But today we’re beginning to see more vertical shopping: Time Warner Center, Lord and Taylor, Barneys – as well as Nordstrom that will soon open at Central Park Tower is on the list of these new vertical superstores. There are townhouses in Manhattan that currently are allocated for completely nonresidential use. 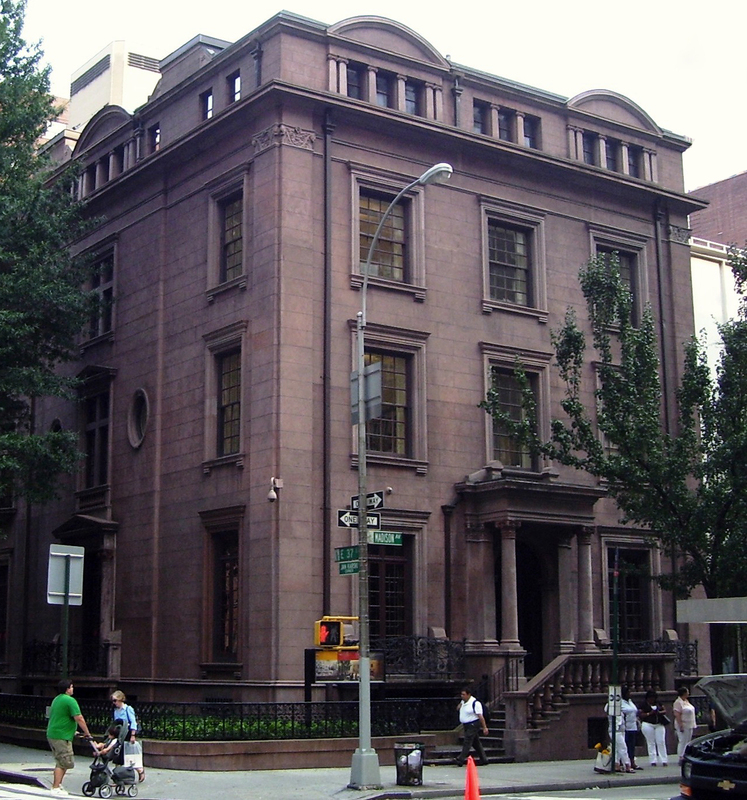 The best and most notable example is Henry Clay Frick House. On his deathbed, the owner that townhouse had been bequeathed it to public as a museum. Today it the famous Frick Collection and the Frick Art Reference Library. Probably the most famous Manhattan townhouse-related legend is the story of Cartier Building on corner of 52nd Street and 5th Avenue. During the last quarter of XIXth century the area was filled with mansions, owned mostly by the Vanderbilt family (whose contemporary heir, Anderson Cooper, you may see on TV every now and then). The Vanderbilts also owned most of the land in the area, and were very careful whom they sold it to – it was Vanderbilts’ greatest concern to not let any merchants into the neighborhood, so that it remained quiet, dignified and upscale. In 1905 they sold the lot of land on the southeast corner of 52nd Street and 5th Avenue to railroad investor and shipping magnate Morton Freeman Plant, who immediately proceeded to build there a posh limestone townhouse, designed in Neo-Renaissance style by architect Richard W. Gibson. The townhouse was surrounded by intricate iron fence with deep areaway between the house and the street, to further protect Morton Plant’s privacy. In 1911, the city made life harder for mansion owners, ordering them to eliminate fences, gardens, stoops, porte-cocheres and protruding ornamentation – anything encroaching on the areas given to public sidewalks. Morton Plant had to get rid of his iron fence and areaway, and now any passerby could spy on the magnate through his living room window. But Plant firmly planted himself in his fortress, and stubbornly refused to sell it to anyone. The magnate loved his townhouse. Despite Vanderbilts’ efforts, the trade gradually invaded the neighborhood, and it started with French jewelry house Cartier, which in 1907 built the very first business building in the area, at 712 5th Avenue near 56th Street. Morton Plant’s young wife Mae frequented their store, and fell in love with Cartier’s most valuable creation, a two-strand pearl necklace. She loved the necklace almost as much as her husband loves his townhouse. She visited the store just to admire the glorious necklace like a work of art in a gallery. The price of the necklace seemed impossible even to the wife of a railroad magnate: $1 million. And then in 1917, Louis and Pierre Cartier offered Morton Plant a deal: the pearl necklace in exchange for his townhouse. That was a tough choice, but to Morton Plant’s honor, his love to his wife prevailed, and he said yes – and moved to a new, even more luxurious townhouse on East 86th street, designed by Guy Lowell. That’s how Cartier became the owner of the famous building, and Mae Plant got her necklace. Was it a fair deal? Let’s find out! The average yearly inflation throughout the century had been 3.07%. This means that $1 million of 1917 money equals $21,252,068.97 today. A four-story Neo-Renaissance townhouse in Manhattan on 5th avenue and 52nd street, for a little over $21 million? Morton Plant made a bad bargain! But of course, you can’t quantify love. My clients often ask me, what’s a smarter investment: a condo or a townhouse? Let me give you a little background information, so that together we can arrive to the best answer. A big issue relevant to qualifying property as a high-quality investment is tax. New York City’s Department of Finance makes a tax assessment of every property by January 5th of each year, and has four tax classes for real estate. Class 1 includes most residential properties of up to three units. This means that one-family, two-family and three-family townhouses, as well as most condominiums are within this class. Class 2 includes all other property that is primarily residential. 4-family townhouses, condominiums that have more than three stories, and, worth noticing, all co-operatives are within this tax class. (Classes 3 and 4 include “property with utility company-owned equipment” and “all commercial or industrial property that is not in the other three tax classes”, respectively) – useful to know, but not relevant for this chapter. We’ll discuss investing in commercial property in due time. The yearly tax assessment sets the amount of taxes to be paid for Class 1 property at 8%. By comparison, properties that belong to Classes 2 through 4 are tax-assessed for 45% percent! So, a Class 1 property that has the assessed cost of $1 million would have a tax assessment of $80,000, whereas similar-priced Class 2 property would be tax-assessed at $450,000. Don’t get spooked before I explain. This tax assessment doesn’t mean that every year you have to pay 8% or 45% of the cost of your property in taxes. It’s just that percentage of your property is taxable. The taxes are actually additionally calculated based on that. What Class 1 property owners paid in 2017 was 19.991% tax on the 8% of property, whereas Class 2 property owners paid 12.892% tax on the value of 45% of their property. Your accountant would probably better explain to you the details of how this has been calculated. How does Department of Finance make these yearly estimations? There are three parameters. 1. Sales comparison. The Department of Finance analyzes sales of similar recently sold properties to assess the correct price of the given property. 2. Cost. The Department of Finance the combined value of the land on which the property is located with how much it would cost to build that property on that lot today. 3. Income capitalization. Finally, the Department of Finance estimates what income could be earned through highest and best use of this property. A small exception from these rules is the estimation of value of cooperatives and condominiums. State law requires that the Department of Finance estimates co-ops and condominiums as if they were rental buildings. Therefore, their value is assessed based on the probable monthly rent of these properties, even though they’re actually not for rent. The advantage of this law is that even if you sold or bought a condo or a co-op at a much higher price, the tax on this property won’t skyrocket because rent value grows slower than sales prices (otherwise at some tipping point the rent would become so unrealistically high that no one would rent the property). Based on the above, from the tax perspective, assuming exactly the same price of a hypothetical property, a townhouse or condominium represent equally better investment than a co-op, because even though your co-op is assessed as a rental, the whooping 45% of its estimated value is taxable. Also from the same point of view, a condominium is better investment than a townhouse, because the taxable 8% of the townhouse value is based on its sales price, whereas for condo it’s estimated based on the rent, which can be considerably lower. Other things that come into play are tax abatements. As a rule, there are no tax abatements on historic townhouses because in overwhelming majority of cases tax abatements are applied to new developments. You can get a condo with tax abatement, if it had been developed within the last couple of decades. The cost of keeping a townhouse may seem prohibitive to many, and from that point of view condo is also an easier investment. The average size of a Manhattan townhouse is about 4,500 square feet. With a condo or co-op of the same size, the average cost of maintenance per square foot in Manhattan is $2.5, which will get you $11,250 in common charges per year. As a townhouse owner, your cost of maintaining the entire building would probably be more like $15,000 to $20,000 per year. You’d pay for repairs and upkeep of your townhouse – drain the flooded basement, fix the burst pipe, fix the roof or pain the façade just the hue of bright orange you saw in your dream – even though you can and should write off certain portion of that cost every year when you fill out your tax documents (consult your accountant). Besides tax, there are other forces at play that can make a townhouse more interesting investment for you than a condo. Over the last couple of decades, we’ve witnessed considerably higher growth in prices of townhouses, even compared to condominiums. The prices of early XXth century townhouses jumped 20% to 30% per year. Anything that’s rare is valued, and old-school townhouses, obviously, are not being built today – but they are being renovated today, just as I described in the previous paragraph – which, combined with their relative rarity, explains the steady and fast growth in price. Notwithstanding that growth, you can always find a buyer for a townhouse, because townhouses are beautiful and rare. Therein lies the main advantage of investing in a townhouse. It becomes a little more interesting if you’ve bought a townhouse and conducted a multimillion dollar renovation, which objectively doubled its value. Or if you demolished an old townhouse and built for example a modern building on that land. The new property may be 5 times the value of the old, and as a full property owner you can do all kinds of interesting things with it, such as converting it into condo and sell some of the units or rent them out – but you stayed within Class 1, your increase in taxable value still can’t go above 6% per year. Of course, you’ve spent a ton of money and effort on construction work, probably had to obtain the new Certificate of Occupancy, and so on – but if you managed to buy the townhouse at low price in the first place, you’re still going to come out as a winner. You probably can’t do it quite on such scale with condos, so from that point of view, if you have the budget sizable enough for bold action, townhouse may be a better investment than a condo, even from tax point of view. And you wouldn’t have to ask board of directors for a voted permission to do anything with your property, because guess what – you don’t have a board of directors! It’s just you and your property and you’re free to do whatever you want with it… unless your townhouse is a historic landmark. Then you’re at the mercy of the Landmark Preservation Commission, but you have no reason to complain because this means that potentially you can sell your property even better. A townhouse allows you much more privacy – no neighbors living in the same building, and you can crank your sound system up to eleven if you’d like. But UPS won’t live the package with the doorman because – well, because you don’t have a doorman. Unless you’d like to install a computer-assisted “virtual doorman” with special instructions for FedEx and UPS. And that device costs a pretty penny, last time I checked. To summarize: a townhouse ownership will cost more and will be associated with higher responsibilities for you as the investor. However, the much faster growth in prices on townhouses, more freedom of action, and abundance of prospective buyers can make a townhouse more appealing and more profitable choice than a condo for an investor who’s comfortable with investing into an average townhouse higher sum than an average condo would require. Ultimately, advantages and disadvantages can be found in any type of property ownership, whether condo or townhouse, and to a large degree it is a question of balancing the pro and con of each individual opportunity. I’d like to encourage you to do exhaustive due diligence if you’re considering an investment in a townhouse – especially if you fell in love with the house and the neighborhood. And you must have full support from a team of experts. At the conclusion of this chapter I’d like to share a small personal anecdote. Back in 1990s, (when I was just a kid, but thought of myself as a real estate mogul) I helped a client to sell a cool townhouse on Park Avenue and 39th Street for $800,000. That deal had no other broker: I represented both the seller and the buyer. The new owner lived in Westchester and bought the townhouse, planning to move into Manhattan with his family. He was a real estate developer by occupation – and by true calling! – so he conducted a complete “gut renovation” of the townhouse, built two extra floors, and installed the elevator. Then he talked to his wife about it, and together they decided not to move to Manhattan, after all. They had a nice place in Westchester, their kids studied in really good schools there, what’s the point of moving to the city, what the hell has he been thinking?! So, he came back to me and asked me to sell the same townhouse for him. That’s how, only a year and a half after the first deal, we sold the house for the asking price or $1.9 million (that’s 237.5% of the original price in 18 months, folks). The second deal had no other broker: I represented both the seller and the buyer. Then suddenly the prices for Manhattan townhouses went through the roof (you know by now that my puns are never accidental). Two years later, the new owner of that townhouse came back to me and asked me to sell it for him. He was into tech, and kept himself entertained by adding a thermostat here, a set of speakers there, until the old townhouse was transformed into one of the first “smart townhouses” in Manhattan. So, we sold it for $3.7 million that time around (that’s 362.5% of the original price in three and a half years, folks)! You know that a real estate broker gets percentage from every deal, right? Today I estimate the value of that townhouse as at least $9 million (prices of Manhattan real estate, especially townhouses, can vertically out-chase any champion mountain climber). I wouldn’t say no to selling that townhouse for the 4th time. Unfortunately for me, the current owner had been holding onto his precious townhouse for over 15 years now. But if we learned anything from the legendary purchase of the Cartier Building, it’s this: any townhouse can be bought when the buyer names the right price. Do you know anyone who wants a townhouse in Manhattan?